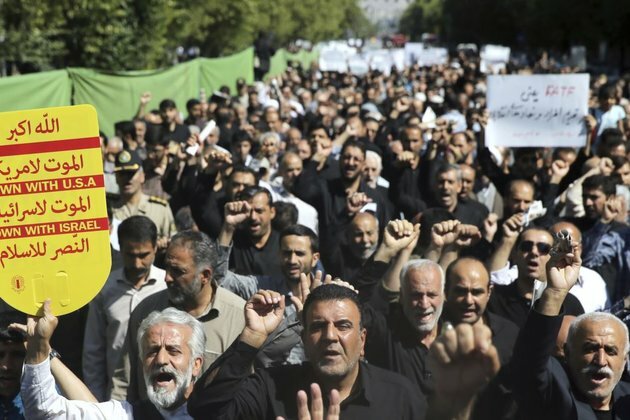 WASHINGTON - Armed conflict between Iranian security forces and separatist militants on the Iranian border is growing, as the government tightens its grip on the minority population. In a statement, the Islamic Revolution Guards Corps (IRGC) blamed 'terrorist groups led and backed by foreign services' for the kidnappings. It asked Pakistan to protect its western borders and facilitate the release of the abducted Iranian forces. Iran's Supreme Leader Ayatollah Seyyed Ali Khamenei last month accused the U.S. and its 'puppets' of plotting to create insecurity in Iran. Iran's Islamic Revolutionary Guard Corps fires missiles from the western province of Kermanshah on October 1, 2018. It said the targets were militants in the eastern Syrian town of Albu Kamal. 'Our activities in Iraq stand in stark contrast with those of the Iranian regime, which is working on a daily basis, through violence and intimidation, to subvert the will of the Iraqi people and undermine Iraq's sovereignty,' the official added. The 'Islamic Republic is insisting on the idea that the Arab-speaking minority could get their palms easily greased by the Arab states because of cultural and linguistic similarities,' Hamid said, adding that the government has increased its crackdown following the September attack in Ahvaz. 'The pressure is so immense that even Arabic poetry night events have canceled their gatherings, fearing they could be arrested and sent to unknown jails,' he said. 'Regime officials are concerned that U.S. sanctions could further destabilize Iran and bring about a movement for change within Iran. They are using the American threat as an excuse to suppress any anti-regime activity throughout the country,' said Hijab. 'We are fighting for human dignity of the Iranian people by speaking the truth about the oppressive and corrupt regime that controls those people,' Pompeo said during remarks at the 13th Annual Values Voter Summit on Sept. 21. 'Religious minorities in Iran are routinely imprisoned, stripped of their rights, kicked out of their jobs and subject to many other abuses,' he added. 'In the past 40 years, there has not been a more spiteful team than the current U.S. government team toward Iran, Iranians and the Islamic Republic,' Rouhani said in a speech broadcast Sunday on state TV. 'I think unfortunately, this semi-Cold War between Tehran and Riyadh is in a stage that the two countries are taking every chance to harm each other, from Twitter vitriol to a war of proxies,' Vatanka told VOA. 'Given the fact that the Saudis are threatening Tehran of bringing the war into Iranian borders, it is not fantasia to assume that these minorities could be a target by the Saudis or other rival states,' he said.